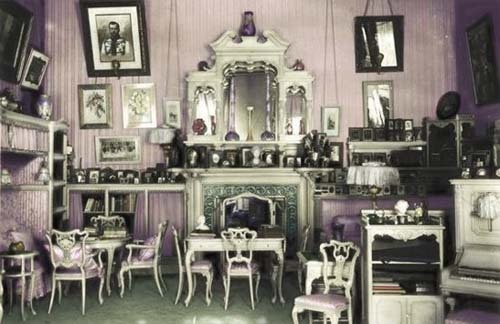 Above: Colorized photograph of the Mauve Room. Alexandra was only 22 when she moved into the Alexander Palace. Until then she had felt like something of a vagabond and perennial guest without a real 'home' of her own. She was shuttled between Darmstadt and her grandmother Queen Victoria's homes at Balmoral in Scotland and Osborne House on the Isle of Wight. Even the Darmstadt palaces in which she lived belonged first to her father and then to her brother and his wife, not to her. When she was a teenager it was understood she would make her home elsewhere with her future husband. Should no husband arrive to rescue her Alexandra's fate would have been to retreat as a spinster to an obscure suite in one of family's palaces or a cottage on some Royal estate - relying on the charity of others. Above: View of the Empress's mauve sofa. When Alexandra came to Russia she was involved for the first time in creating her own living spaces. She was inexperienced and most of what she knew about decorating came from magazines and the advice she had received over the years from of her English Grandmother and observations of Victoria's old-fashioned, sentimental style of decorating which dominated a century. Although Alexandra's tastes were conventional and hesitant she made many suggestions to the decorator, Roman Meltzer about placement of furniture, colors and fabrics. Her objective was to create a bright and cozy environment for her husband and future family. She wanted a room where Nicholas could come and unburden himself from the affairs of government - a sanctuary where they could be together, safe and alone. As Alexandra worked with Meltzer price was never discussed. This was considered undignified. Not knowing prices was disconcerting to Alexandra, who was used to very carefully managing her money like any good German "hausfrau". She wanted to keep costs down while everyone else involved seemed not to care at all about cost, focusing instead on obtaining the finest quality materials available. The total budget for the redecoration of the Alexander Palace would have astounded the young Tsaritsa, if she had been brave enough to enquire what it all had cost. 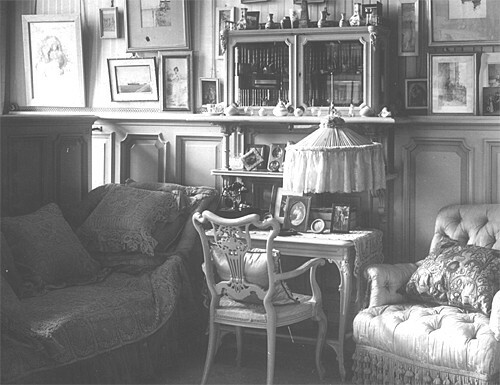 The Mauve "Boudoir" was Alexandra's favorite room and for 20 years it was the center of her family's life in the palace. At the time it was the most celebrated room in Russia and the subject of much gossip as to the events that were supposed to have taken place there. Even today it remains a room of mystery and it is the room of the palace which interests the public the most. The room was also much derided for its' style and family atmosphere by elite society of the time. Elegant Petersburg thought proper Romanov Empresses should live semi-publically in splendid rooms graciously decorated in the latest style with fine art and sophisticated furnishings. For 21 years - though changes in style and decorating came and went, Alexandra resisted any suggestions to remodel this room. It held too many memories for her and she was determined to keep it just as it had been when she was married. This meant the Mauve Room, which was considered lovely, modern and very chic in 1896, was hopelessly outdated, quaintly old-fashioned and something of an inside family joke by 1917. The opal tones, art glass and delicate furniture had long since gone out of style in favor of bolder effects. Left: Built in corner sofa in the Mauve Room. The Mauve Room received its' name from the opal-colored silk on the walls, which was made by Charles Berger's firm in Paris, a company which still exists today at the same address in the French capital. The fabric was described as a Lampas Violet Reseda and it was extremely expensive. The total cost of the silk and trim in the Mauve Room exceeded the cost of any of the Imperial Fabergé easter eggs. Matching fabric from a Moscow firm was used to cover the furniture. This fabric differed slightly from the French material as it was slightly lighter in tone and had a raised floral motif woven into it. Both fabrics were of lampas silk, which is a raised reflective weave which gives the material a unusual soft glimmer - particularly at night by artificial light. Alexandra liked the color mauve and she personally picked the fabric and hue. It is said she asked for a color to match a favorite sprig of lilac given to her by Nicholas. In Russia the color mauve is called "lilac" and there this room is called the "lilac" boudoir. Mauve was popular at the time and it became increasing so during the Edwardian era. Its' delicate tint can range from 'ashes of roses' to a light lavender. It was not only a color of the spring garden but also a sentimental color of mourning and remembrance. The inherent sadness and introspection of the color would have appealed to Alexandra's shy personality, which was immersed in sadness from a young age. The Empress indicated her love of pastels and watery effects in her selection of jewels; she preferred pale aquamarines and blue topazes over more expensive stones. Pearls, with their soft opalescence were her great favorite. As a wedding gift she was given a magnificent set of pink pearls by Alexander III, which at 700,000 gold rubles was the most expensive commission ever received by the firm of Fabergé and it began a relationship between Alexandra and the firm that would last the rest of her life. Alexandra's engagement ring from Nicholas was also a large pink pearl and her favorite earrings were a pair of pink pearls set with a large diamond. Photographs of her indicate that she wore these earrings often and their remains were found burned and trampled in the mud at the Yekaterinburg mineshaft after the murder of the family. No door lead from the palace corridor into the Mauve Room - one could enter only through heavily draped double doors, carved with flowers, from the Pallisander Room or the bedroom. A matching curtain covered one of the two huge windows of the room. The curtains were made up from Charles Berger's expensive French mauve silk and they were heavily lined and sewn with ribbons, fringe and huge soft tassels. Due to the size of the huge windows of the room and the fact that one of them - a mahogany, arched frame - had only a thin silk shade to cover it, the room was very bright during the day. The second window - nearest the bedroom - was a giant picture window with a huge single pane of glass which made the outside trees appear to be part of the room. The Alexander Palace was wired for electricity in 1895 in preparation for Nicholas and Alexandra's occupancy. Wires for lamps in the Mauve Room ran right underneath the silk wall covering, which caused problems when repairs were required and caused worry about fires. The fuse boxes for the lighting of the room were far away, in the basement. At night the lighting of the room was soft and indirect from a number of table lamps and the wall mounted picture lamps which illuminated the most important paintings of the room. These lights were all centrally controlled and went on one after another when switched on. There was no central chandelier in the Mauve Room. The Axminster carpeting of the room was pistachio-colored with leaves in a darker hue; it came from Great Britain and was sewn together in strips. Left: A chair from the Mauve Room. The lower part of the walls of the room were lined with cream-painted panels alternating with square and concave corners. The wood furniture was in the French Rocaille style, carved with crisply carved motifs of swirls and shells. Made of lemonwood, the furniture was custom designed by Roman Meltzer and made by a team of artisans in his family's St. Petersburg factory. 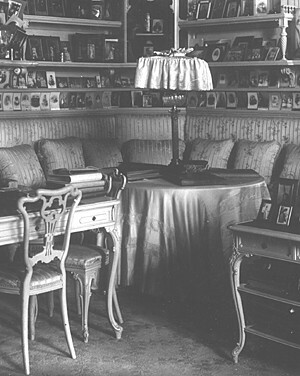 A chair from the suite created by Meltzer is seen at left. The frame of the chair is delicately thin and large guests must have thought twice before sitting upon it. Despite its' appearance of luxury and refinement all of the furniture in the Mauve Room was used daily in a rough-and-tumble family environment. Alexandra loved the company of her children and the many family pets in her boudoir all of which took their inevitable toll on the furnishings. Great bolts of extra fabric and carpeting were kept in reserve as replacement for the inevitable wear and tear. The most famous spot in the room was Alexandra's renowned mauve-colored chaise-longue which stood behind a wood and glass screen near a large planter filled year-round with sweet-smelling plants. The couch was built on a wood core with springs and many layers of soft padding. It was double covered in silk and decorated with rich tassels and thick fringe. The Empress, a semi-invalid, was apt to spend much of her day here surrounded by her family and her most precious things. She lay upon the couch propped up by hand-embroidered pillows and would by draped by a crocheted, silk-lined coverlet made by her own hand. The Empress was an expert needlewoman and she taught her daughters the art of embroidery. She was definitely of the school that "idle hands were the devil's workshop" and she never liked to see her children's hands unoccupied. In the evenings, when Nicholas read to the family, the Empress and her children would quietly work at handicrafts. She also taught her children, including the Tsarevich, knitting, while the girls also learned crocheting and lace making. There were puzzles and games in baskets for the children to play with. Current copies of most of the major English language and Russian magazines were stacked in stands along with the family's favorite music. There were even some American magazines - including National Geographic. Installed into the walls were bookcases crammed full with the Empress's favorite editions. 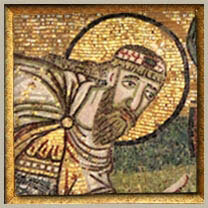 There were many serious books on religion and philosophy, as well as light romantic novels, art books and travel guides. Almost all of these were in English, the Empress's day-to-day language with her husband, staff, friends and children. Large photo albums with neatly pasted snapshots taken by the family were stacked on tabletops and placed on shelves. All of the Imperial family were avid phographers and each kept albums of favorite snapshots. 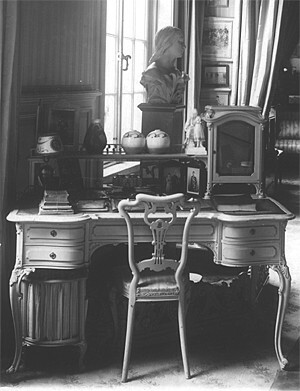 Right: The Empress's desk in the Mauve Room. There were many paintings and watercolors in the room. Alexandra's favorites were a pastel oil by Nesterov of the Annunciation given to her by Nicholas in 1897, a painting of her mother Alice by di Angeli (Queen Victoria had a copy, as well), a large painting of the Virgin sleeping by the French artist Papion - which hung above her mauve sofa - and portraits of her husband and son, Aleksey. Alexandra was an accomplished watercolorist but she was rather indifferent to 'fine art' - selecting works for their subject matter or association with specific, people, events or trips she had taken rather than for their technique or the artist who had painted them. The only artists she specifically favored were Zichy for his florals and Nesterov for his religious works. 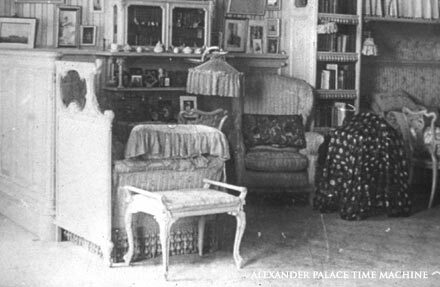 In almost all of her rooms could be found a copy of the family's favorite ikon, the white-cowled Lady of Tsarskoe Selo The Mauve Room also had a Becker piano enclosed in a cream-colored lemonwood case; custom-designed to match the decor of the room by Meltzer and built by his own workmen. The shelves of the room were crammed with photographs of relatives and friends collected over the years. There was also a considerable amount of art glass - one of the Empress's passions - and porcelain collected on family visits to Denmark and regular excursions to the Royal Copenhagen factory. The Empress's small working desk stood by the window at an angle. She was a prolific letter writer and wrote from all sorts of places around her rooms on portable writing pads. Normally she used her own stationary carrying her Imperial monogram, but she would often also use any paper handy at the place she found herself, including her children's stationary when she was upstairs. Alexandra was notoriously negligent with her papers and letters, which were piled here and on the table near her mauve sofa. This must have driven her husband mad as he was the exact opposite - neat and tidy to an extreme. A telephone was installed by the Swedish firm Eriksson on the table near the sofa. The telephone was connected to other phones in the palace and also to the outside world. The telephone operator for the palace was situated in the basement and was connected from there to an exchange on an upper floor of the Imperial Lyceum across from the chapel of the Catherine Palace.